We have some beautiful, sweet rhubarb growing down on the allotment, and it is ideal for making one of my favourite desserts - Rhubarb Crumble. 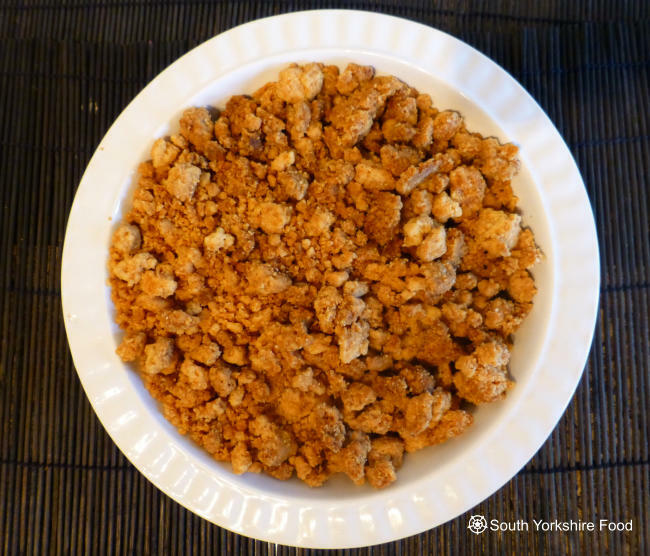 This recipe cooks the crumb first so you are guaranteed to have crisp, nutty biscuit topping. Serve with custard, cream, or vanilla ice cream - or maybe all of them! Heat the oven to 200°C/180°C/400°F. In a food processor whiz together the crumble ingredients until you have a soft crumb (or do it by hand in a mixing bowl, gently rubbing all the ingredients together). Spread the crumb mixture onto a baking tray in a thin layer. Bake in the oven for 5-6 minutes until lightly golden brown. Remove from the oven and break it up a bit with a fork, then back into the oven and repeat this a couple of times, until you have a lovely crunchy topping. Put aside to cool slightly. Now wash the rhubarb and cut it into 5cm long pieces and place these in layer in the bottom of an oven proof dish. Sprinkle the sugar all over the rhubarb and cover with aluminium foil. Take it out of the oven and use a fork to gently turn over the rhubarb stalks. It should be starting to get soft. Put it back in the oven, without the foil, for another 10 minutes. By now the rhubarb should be soft - if not give it another 5 minutes. Spoon the rhubarb into the bottom of an oven proof serving dish and cover with the crumble. You can now sprinkle more sugar on top and brown it under the grill, or just serve it as it is, with either custard or vanilla ice cream.